Some of the most dramatic messages that have ever been uttered in the English language actually used very simple words to stir the blood, or touch the heart. Look at any well-known passage in the Bible. Chances are that the passage does not rely on sophisticated words to create its power. Think of Lincoln's Gettysberg Address. Although President Lincoln spoke in a style that is very different from the way we usually speak today, his words still have the power to move us deeply with their clarity and their deep emotion. During the darkest days of World War II, Winston Churchill's rousing speeches to the British people used very simple, common, powerful words to successfully ignite the courage and determination of his people. So if it's possible to communicate effectively without using a lot of very big words, why should we bother to try to expand our vocabulary? The reason is that learning new words expands our understanding and improves our "mental muscles". Every new word we learn entices our mind to stretch into new areas. If you want to increase your vocabulary, there are many approaches you can use. One good way is to read books or articles that are slightly more difficult than what you are accustomed to. When you come across a word you don't know, see if you can figure out its meaning from the context. Look at the way the word is made up, with its letters and syllables. Does it remind you of any words you already know? What parts of it are familiar? If you come across a word you don't understand during the course of a lecture or a conversation, you can ask someone to explain the meaning of the word. Many people are reluctant to do this because they are afraid of exposing their ignorance by asking. It is occasionally true that other people may choose to look down on you if you confess that you don't understand a certain word. On the other hand, they may be happy to teach you something new. If you decide you don't want to ask anyone else for the meaning of words you don't know, be sure to make a note of those new words and look them up later. All dictionaries are not alike, and you may find a certain version far more useful than the rest. 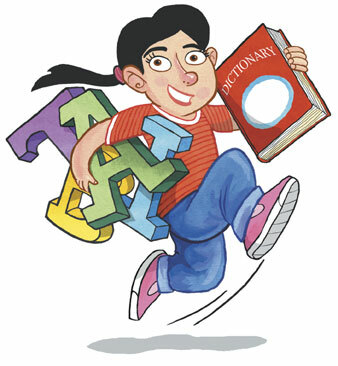 Good dictionaries will do more than just give a definition of a word. Some will show you an example of the word used in a sentence. Often they will show you alternate spellings, and give the plural forms of nouns and the past tense of verbs. Most dictionaries will show you correct pronunciation. Some will tell you the historical derivation of the word. Many English words have their roots in ancient Anglo-Saxon, French, or German. If you are committed to expanding your vocabulary, how many new words should you try to learn in a day? It's up to you. Just two new words a day will add up to more than 7000 words in ten years. Ten words a day would add 36,000 words in ten years. Don't use an impressive vocabulary merely as a means of showing off, always using big words when small ones would do. People can often intuitively feel when you are using fancy words merely for effect, and not because you need them to communicate.